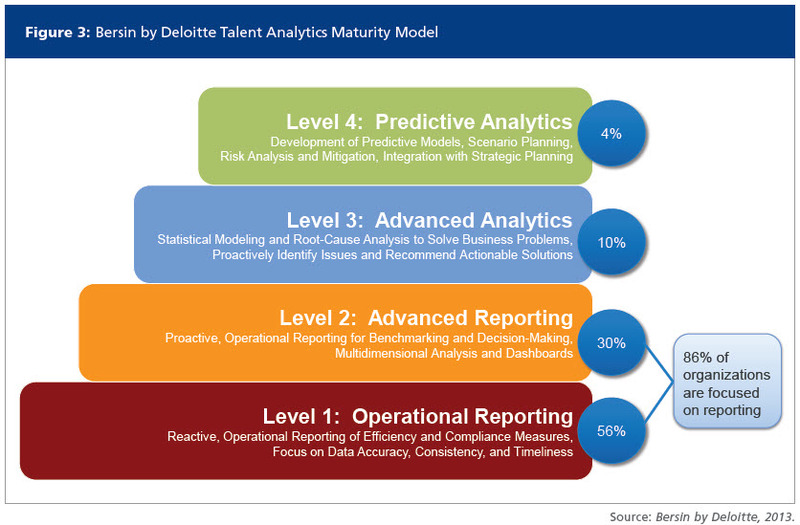 We have seen talent analytics evolve alongside the rise of the internal HR analytics function. However, there is still a way to go before business really has the skills and knowledge to turn HR systems into truly predictive platforms on which to manage their end-to-end talent needs. In this post I share insight from our most progressive clients for upping the game from HR analytics, to true talent analytics. According to research by Bersin and Deloitte, 86% of organisations use HR analytics for reporting. Although at different stages of maturity, it’s still very much focused on the here and now. In Armstrong Craven’s own research, we find a similar picture with most analytics platforms being used to report on employee engagement, workforce planning, compensation data, sickness and absenteeism and tender management. Whilst there is a need for reporting, there is great opportunity to use the same data for true talent analytics; this is the holy grail of HR. How to predict the stars of the future from early career? How to predict when and how talent will truly maximise its individual potential? At what stage in their career will they reach a ceiling? And does that ceiling match the organisation’s needs? How to avoid investing in the wrong areas, whilst ensuring hidden talent doesn’t fall through the gaps? How to create and manage leadership programmes on a truly global basis? Bringing together psychometric data with information from hi-potential programmes, coaching programmes, internal appraisals and using predictive analytics, HR can create a scorecard. What are the early career triggers that indicate this is a person who is going to go all the way? Can this data be used to determine who to put onto leadership development programmes and where to channel organisational resources? Our most progressive clients are starting to do this. Could you be doing more to compare external data with your own? Are there are opportunities to partner with your HR software and social providers? To compare succession data with broader talent data? With market norms? Or the world’s most admired companies? Plotr, a careers resource for your people based around big data means organisations can build ideal role profiles and that vacancies are mapped into Plotr’s psychometric game. Plotr effectively takes internal company data, collates it into a big data set, and uses it for a greater purpose to the benefit of all parties. Some global businesses are struggling with fragmented data, dispersed across a multitude of different systems enterprise-wide. Purely from a talent perspective, a global pharmaceutical company we work with is struggling to collate all their past talent data to build out predictive models. They are grappling with how to influence their assessment providers, external leadership development consultancies, and executive coaches to make past data accessible, to work off unified, global systems and adapt their practices to feed the data in a format that can be captured and analysed. Consultants and other suppliers need to align their methodologies if the client is to maximise use of the data. Increasingly we see specialist teams being created. Analytics teams in the most progressive organisations are business-facing and aligned to main business units at VP level. Some organisations have gone a step further, creating the position of Chief Data Officer, with a seat on the board, owning and advising on group data strategy. In order to ensure the link between business performance and people can be quantified, the HR Analytics function must also be closely aligned with finance, and able to build strong links with external suppliers of data. Against this backdrop, one of the key challenges faced by businesses is the lack of statistical and quantitative analysis skills within HR. This is often compounded by a lack of communication and influencing skills and overall business acumen within the technical expert population. Thus the bridge between HR Analytics and the rest of the business remains wide and a number of companies are in the process of making changes to the structure of their analytics functions. Again, the increasingly senior nature of roles such as Head of Workforce Analytics and Head of Group Workforce Insights reflect the need to address this. We see these functions amongst global banks and the tech giants, and expect to see this replicated across other sectors in the coming months. An article on the topic, including Armstrong Craven’s comments was published in The Times recently. A Director of Workforce Management at a large telecoms provider that we work with believes that in the last ten to 15 years, HR has lost credibility because data insight hasn’t been taken seriously enough. Perhaps taking analytics to the next level of application is one way in which HR can support the business at the highest of levels? If you are already linking workforce engagement with profits for example, you are already in the talent space – but only just! If talent analytics can be put to use for more sophisticated applications, it can help the business to address people risk in the way you manage any other business risk.